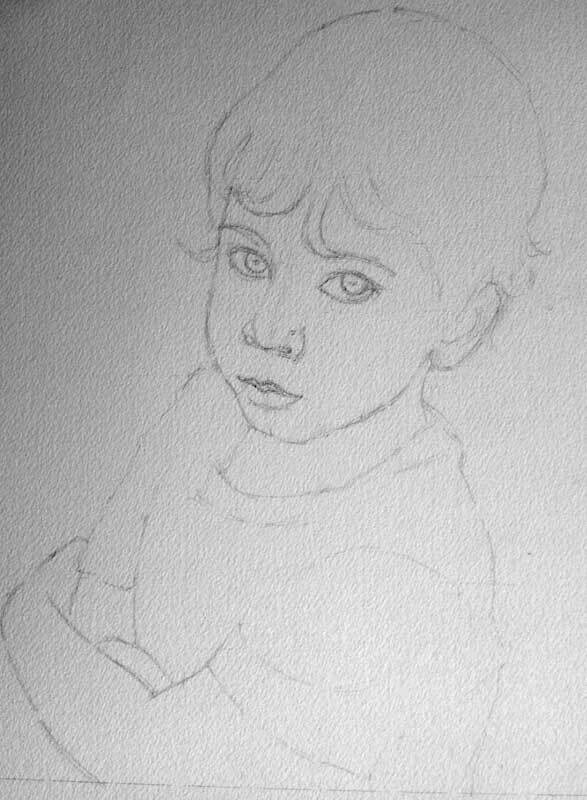 This is Theo, the little brother of Simon, whose step-by-step portrait I posted a while ago. 1. This is the initial translation of a photo to an artwork that I do. It lets my collector see what I see when I look at their photo. It gives them a rough idea of the final result. 2. In the absence of a live model (not that I paint dead models...wait, yes, I do...) - anyway, most of the time, people, kids especially, do not sit for my portraits. They send me photos and these photos are the only source of information about them that I have. So, spending some time with the pictures, and making these little sketches of them, is a way for me to get to know them a little better. 3. Finally, these sketches are essential tools I use for planning my paintings. How much of the photo do I crop? Do I need to rotate things? Move something? Delete something? Which colors will I use? Which values will work best? All of these questions can be worked out in advance, in a thumbnail sketch. On to Step 2, Drawing. Step 4. Once my first wash was dry, I lifted off some of the green on his face and began adding definition to the shadow areas. Step 5. Adding light blue washes on his forehead, chin, and above his eyes. Defining his eyes, nose, lips, and ears more. More texture along the hairline. This is a Cotman 1/2" flat brush but any softish synthetic brush will do. I originally bought it for the one and only watercolor class I took in the U.S., and it didn't take as a painting brush. It's great for blurring the edges though. Step 7. I added another background wash to deepen the color. A little more fiddling with the details. Step 8. The background wash left a hard edge around the head (phtalo blue tends to do that). So I softened the edge and lifted off some hairs here and there. Done! 10 x 8" Watercolor on Arches cold press 140lb watercolor paper. (Both of them also have step-by-step posts, here and here). You can barely see anything here because in portraits, I tend to keep the drawing minimal. I don't map out areas of light and shadows and prefer to that with paint. This drawing was made using grid method directly on the watercolor paper. Very lightly, I mapped out main shadow areas, while leaving most highlights as the white of the paper. From now on, it's building up the layers with the general idea of keeping the color cooler in the shadows and warmer in the lights. Some more form modeling here. Still keeping the highlights white. Most of the time, my portrait palette consists of a yellow, a red, and a blue. Sometimes, there is an additional version of each color - a cool red (quinacridone red), a cool yellow (quinacridone gold), a warm yellow (indian or hansa yellow), and a warm blue (french ultramarine or cobalt). In this painting, I also had small areas of phtalo blue (cool blue). Working with smaller brushes, increasing value contrast (i.e. making dark things darker next to light things, which makes them pop), softening some edges. And the finished, color-corrected version! Watercolor and ink on hot press paper. Original sold. Prints and cards available. First step: completed drawing at the plein air session. By the time I was done drawing, it was getting close to sunset and windy, so I decided to do the painting part at home. Here, I am beginning to lay first washes. The paper is hot press, so I'm getting some nice blooms! I have some white areas left here but most of the painting has a layer of paint. Evaluating if the contrast between the white columns and dark spaces between them is too dark. So it is. Also, not crazy about the foreground. 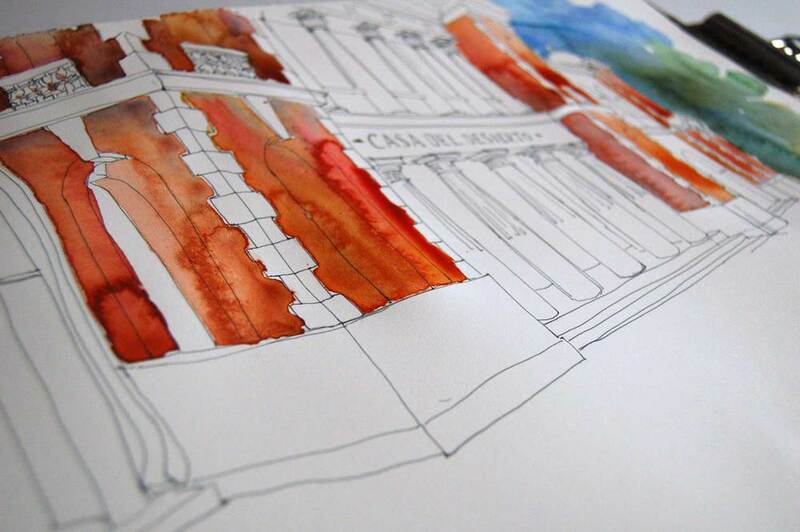 One step further: I toned down the white areas and lightened up the shadows between columns. I also decided to separate the far right side of the building from the background by darkening the tree area. The foreground got another wash of gray-blue to tone it down and ground the building. Brick detail on the left side and a bit of cleaning up in the shape of the columns and bottom of the building. At this point, I got a feeling that my problem with the foreground might be because it was also too large. I began thinking about the best way to crop it. Final, cropped version. The foreground is significantly darker and quieter. I took off some of the paint first, by wetting the area with a soft brush (to agitate the paint and make it liftable without damaging the paper) and blotting with soft tissue paper (like Kleenex). I repeated the process once or twice. Then, I covered the area with a fairly uniform wash of mixed gray (French Ultramarine + Quinacridone Red + Quinacridone Gold). Another step-by-step! 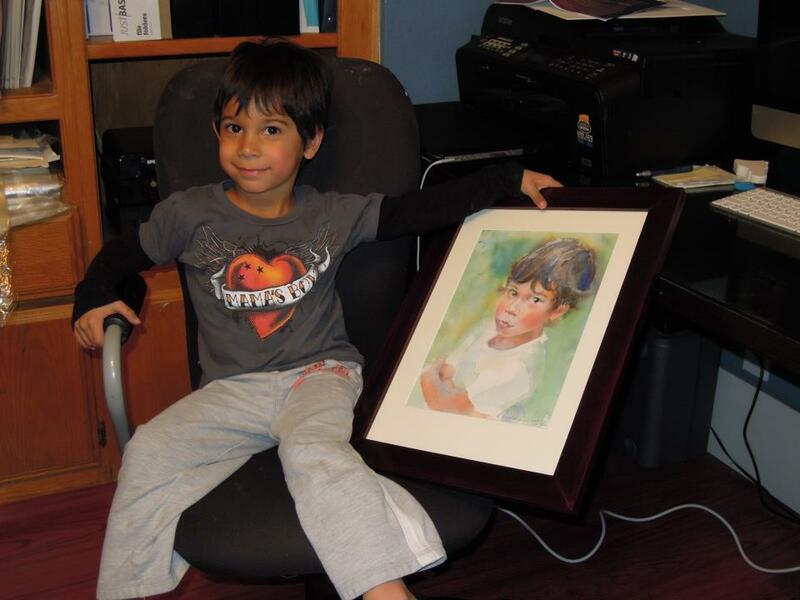 This little guy is my son's best buddy (on most days :)) The portrait painting was a Christmas gift to his dad. I had a choice of several very good photos to work from. I love it when collectors trust me to make a recommendation, or even decision, on what photo would make a better painting. At this point, I can work from unimaginably bad snapshots but it's always easier to begin with a good photo reference. Out of the photos I was given, I liked the one I ended up painting right away, and the collector also suggested one with the classic looking-straight-at-the-camera pose. Step 1. I made two thumbnail sketches based on the two photos we chose. The sketches help me get more familiar with my subject and also kind of test out my initial feelings about the reference photos. I definitely liked the one on the right more, and after a discussion with the collector, she agreed with me. The sketch on the left is your standard kid picture (minus the usual toothy grin). Any kid. The one on the right is definitely a particular kid, the one with the attitude and his own thoughts in his head, and it's Vaughn. Step 2. Drawing using the grid method. 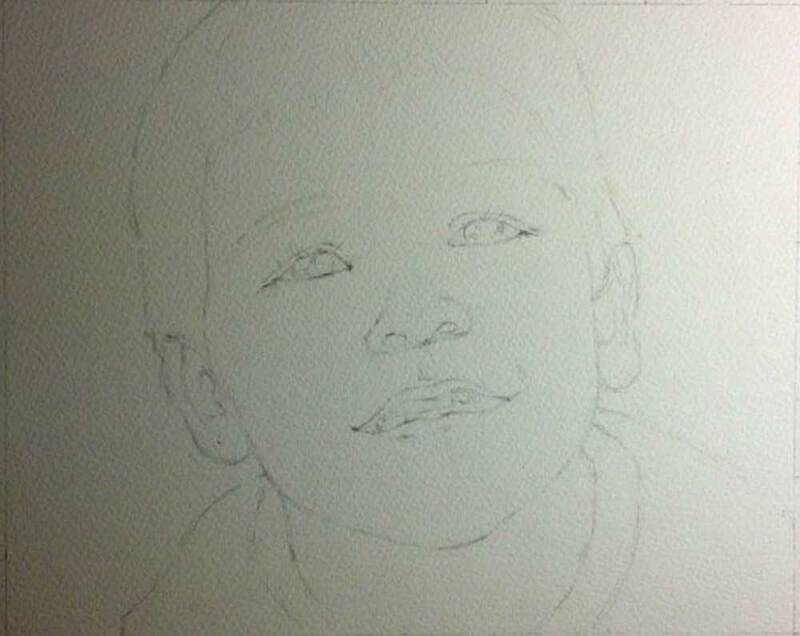 Since I had both a tilt and a turn to his head in this portrait, it was important for me to double-check the grid drawing with a few ellipses connecting the facial features of the boy. If you have no idea what I'm talking about or want a refresher course, I recommend the free YouTube videos by Stan Prokopenko. Good stuff! Step 3. I jumped right in! Beginning with the eyes (I felt that they were the most important part of the painting). Step 4. I like to integrate the figure and the background (vs. painting them separately), so here is what it looked like after one wash. At this point, I let it dry. Step 5. The background is left as it is. 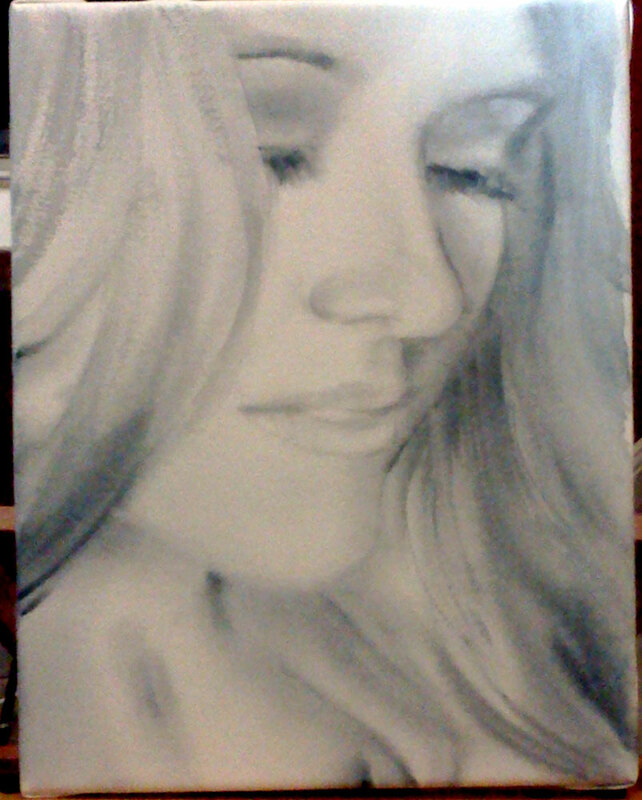 I concentrate on the face, defining the main light and shade patterns. It helps to know where your light is coming from. In this case, it's on the top left. 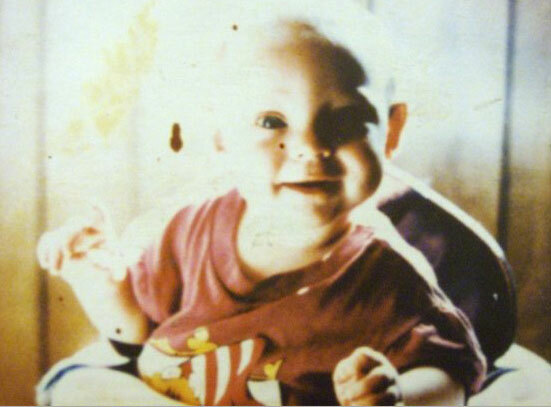 This means, for example, that the left side of the boy's head will be a bit lighter than the right. Step 6. More detail on the face and arms. I also decided to define the edge of his farther shoulder by placing a light background wash next to it. 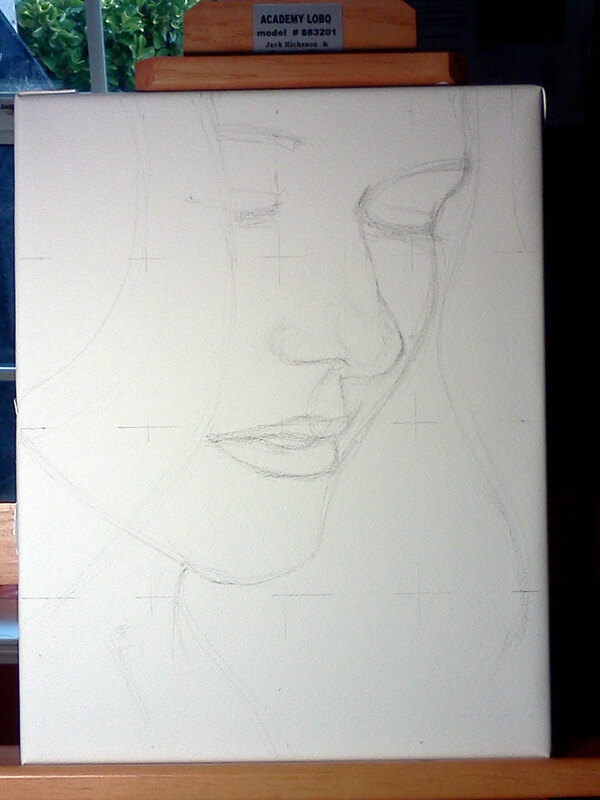 Time for another step-by-step painting? I think so! This one is also a portrait study, which means that it's smaller, less detailed and less time-consuming than my usual full-blown portraits. 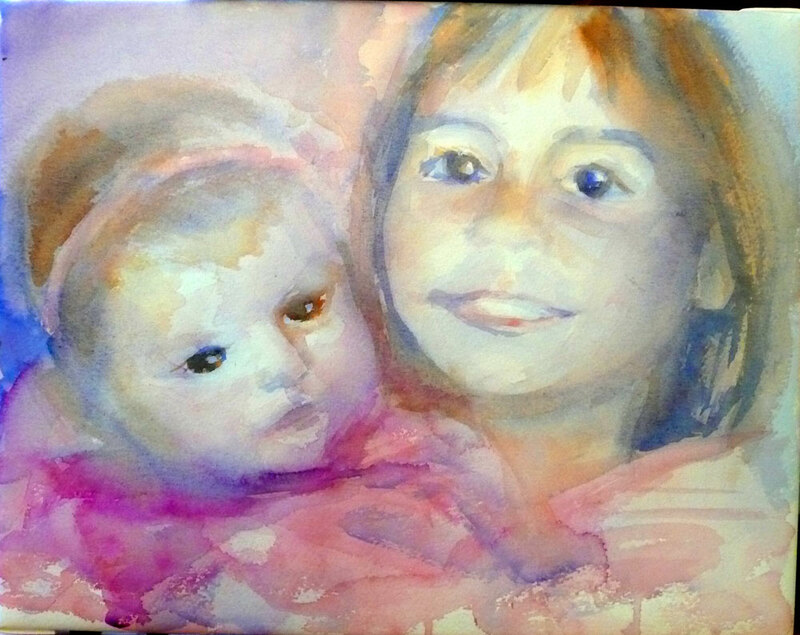 My grand idea is to make two largish paintings of my kids. Step 1. Drawing using the grid method. Step 3. Doing mostly negative painting this layer. I could have called it done at this point but I wanted more definition. 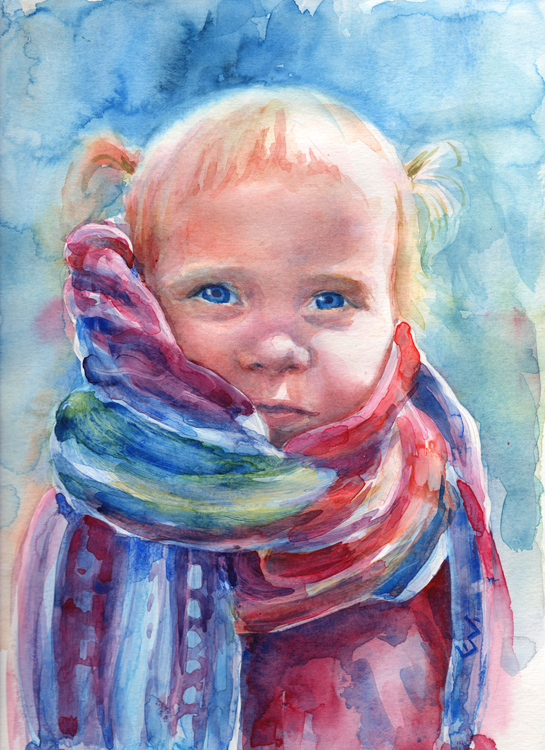 Partly because of the mounting pressure (grandparents, friends, random people who make the connection between the artist and the baby) to paint my beautiful baby daughter, and partly because I just needed to paint something and enjoy it, I made this little wet-into-wet study. I call it a study because I have a grand idea to make two largish (24x24 or larger) paintings of my kids to go on our bare walls. Step 1. Drawing. I used the grid method, with grid lines every inch. Step 2. First layer, wet-into-wet (except for the highlights in the eyes, those I left dry). Step 3. Another layer of wet-into-wet, with a few details added. I wanted to keep everything soft except for the right eye, so I left most of the edges alone without going back and defining them more. I can see so many things not quite right with this painting...especially when comparing to the reference photo - but at some point, you just have to let it go. Overall, I am happy with the freshness and softness I was able to achieve. What do you think? P.S. Want me to make a painting from your photo? Read more here or contact me right away. Thank you! Here's your free eBook! Enjoy! First of all, let me say that I was immediately inspired to paint this portrait when I saw the reference photo. I love the backlit figure against the pumpkin patch background, the abundance of rich colors and, of course, the priceless expression on the little girl's face. I knew it was going to be a good painting right away. After the sketch, I stretched my paper and made the drawing using the grid method. A word about using the grid method with portraits: after you find your reference points and locate the facial features, make sure you double-check your drawing with the usual facial proportions rules. I.e, the vertical center line hits the features in the middle, the horizontal lines of the eyes, bottom of the nose, and mouth are parallel, the distance between the eyes is approximately the width of one eye, the lines from the wings of the nose to the inside corners of the eyes are parallel, etc. Next step: wet-into-wet background wash and ultramarine blue in the shadow areas. I also put light yellow, red, and orange washes over the skin areas. Next, I continue working on the hair and face, put a wash over the shadow side of the pumpkin and reclaim the round shape of the pumpkin on the right using a scrubber brush. Next, more work on the pumpkin and main shapes of the face. i also deepen the skin tones using transparent quinacridone red and quinacridone burnt sienna. Next step. I might be guilty in spending too much time an effort on the hair, but I just can't help it. I like painting hair. I darken the shadows throughout the painting, define the eyes, soften the hard edges around the hand and add detail to fingers and the girl's dress. Almost done. From the last stage to the completed painting, it's just a matter of deepening the shadows even more and refining the important details. I also add a few spots of semi-opaque yellow to the pumpkin and, in a more transparent manner, the girl's face. These last steps seem fairly insignificant, and you may say that the main idea of the painting was already stated in the previous stage - but they often take the longest time with a lot of reflection and evaluation. When my additions and refinements are no longer making the painting better, I declare it finished. I find it important to take it slowly at the end, so that I have a lot of opportunities to step away from the painting and come back to it with a fresh eye. It helps me catch myself before I overwork it - although, of course, the level of finish is very subjective. Some other artist would have stopped twenty hours ago, while another one might want to work it to a more realistic stage. Ampersand Aquabord is nice. 2" deep cradled Aquabord is even nicer! You don't need to mat it, just spray it with a fixative and varnish. You don't even need to frame it. Stain the sides any color you want and it's ready to be put on a wall. The painting above was born partly of the client's wish for a smaller size and partly out of my desire to try the cradled Aquabord. Reference photo: their very attractive corner of the yard. I love the windmill but I also felt that it would compete for attention with the pot. And, since we decided on a square format Aquabord, I would have been difficult to squeeze it into the composition. As in most of my commissions, I spent some time doing preliminary sketches. We went with this one. I skipped the drawing - I typically don't feel the need for pencil lines unless the subject is complex. 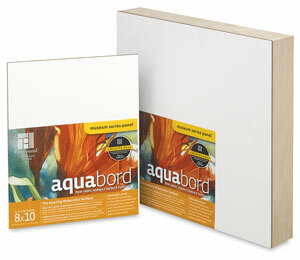 For the first time ever, I noticed that on the Aquabord packaging, they recommend washing it with clean water before painting. So I did. It bubbled a bit (which it is supposed to do) and behaved much more wet-into-wet than I expected. If this last phrase sounds odd to you, I just mean that the paint spread and mingled better. That's what the 2" deep cradle looks like with a 6x6" board. I like it. Next layer: trying to keep the flow and spontaneity of the first wash while adding a lot of detail. Not easy! Here's the proof that I have not stopped painting nor forgotten my blog anniversary photo contest winners :) One of the paintings is now complete! 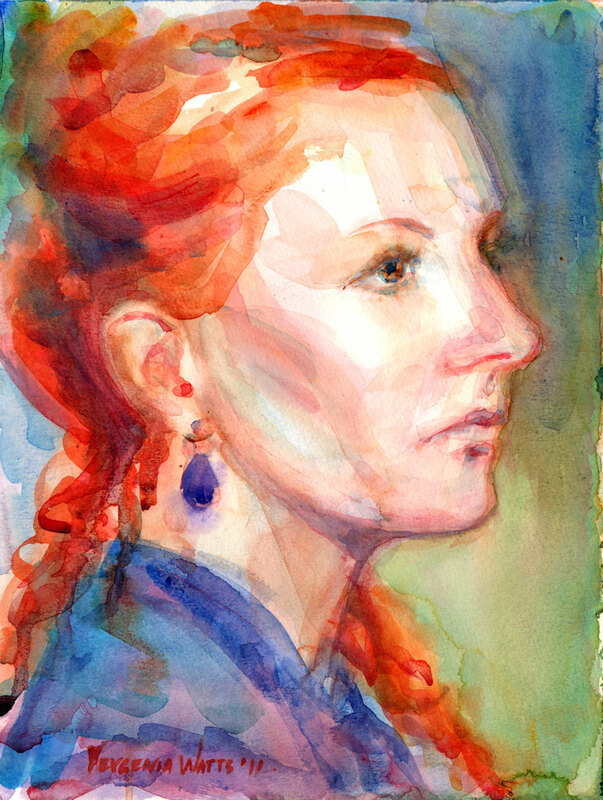 12 x 9" Watercolor on Lanaquarelle rough 140lb paper (actually, I forgot this was the rough paper, which isn't often used for portraits). 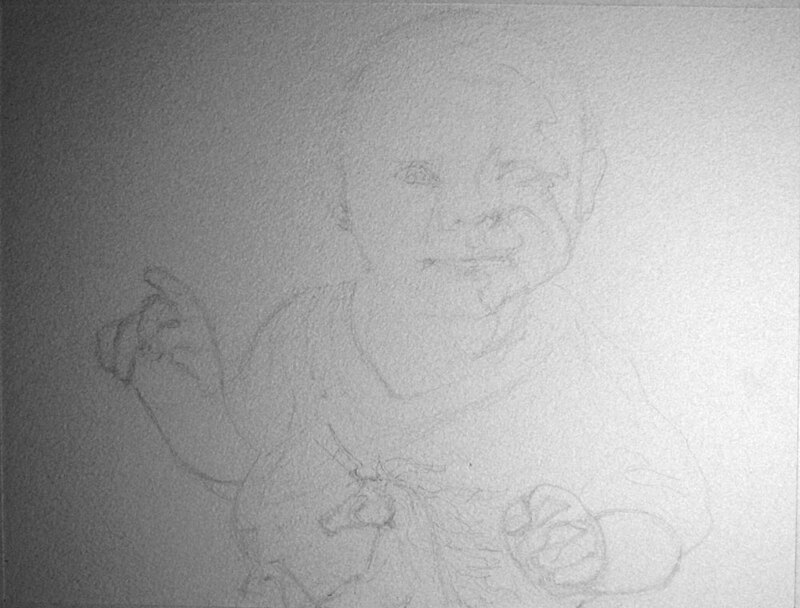 As usual, I started with a sketch to decide on the composition and value - but I forgot to scan in the sketch : /. Here, I already made the drawing and laid several layers down. Since this was a memorial portrait, I chose to stay away from the more expressive, impressionistic look that I've developed through A Portrait A Day. I continued to model the form and began adding her makeup. It was quite interesting to see how the painting suddenly started looking like the reference photo, just because I darkened the eyelashes. Lastly, I deepened the shadows, softened some edges, added more color throughout, and added blue to her clothes to echo the eyes a bit. I also got rid of most of the shadow on the side of her face (which was very dark in the reference photo but just didn't look right in a painting). I used a thin wash of acrylic gesso to cover the staining color I couldn't wash away. Scrubbing doesn't work very well on this paper, so it wasn't a real option. 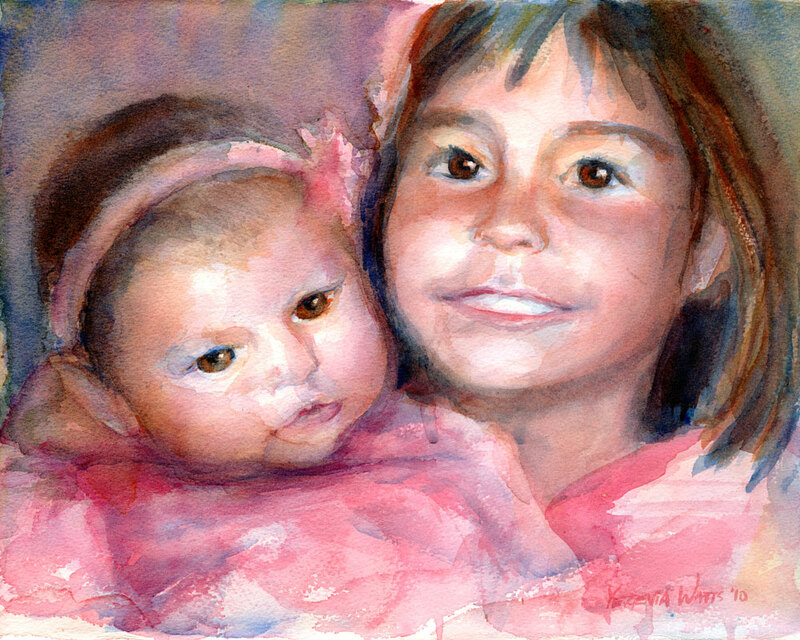 The girl's parents were happy with the portrait...And I felt that it's the least I can offer to someone who's lost a child. I don't think I would be able to cope with something like that. 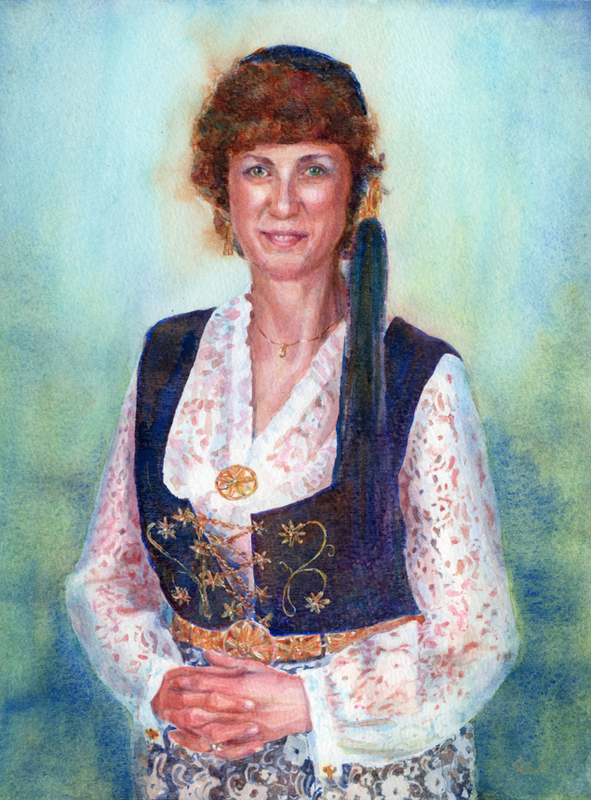 To learn about how you can order your own custom portrait, go here. It's safe to say that it's no more a "portrait a day" - turns out I can't quite afford a reliable hour every day devoted to painting something for myself - but I'll keep counting them until I get to a stopping point (the current idea is to make it to September 2, a year after I started the project). 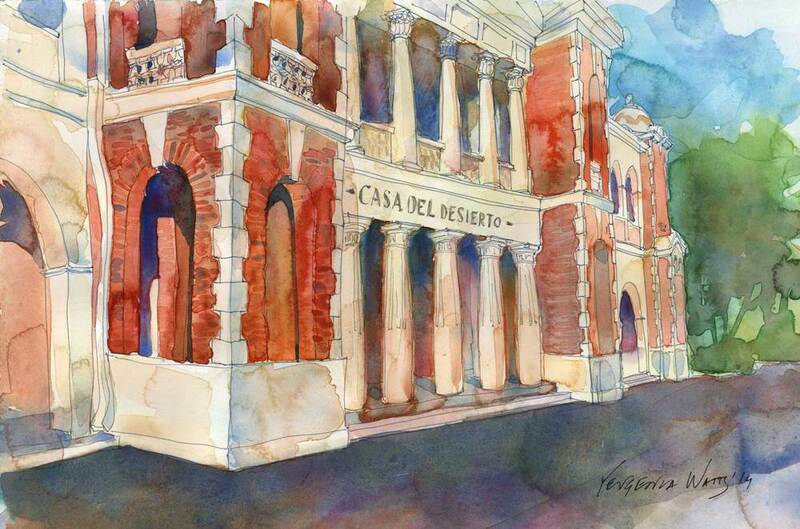 12x9" watercolor on Canson Montval 140lb CP. I really needed the excellent lifting ability of this paper here. It doesn't take layers or do granulation as well as other papers do, but lifting is so easy! I also removed the baby seat and added the unicorn on the shirt - the unicorn has special meaning to the recipient of this painting. 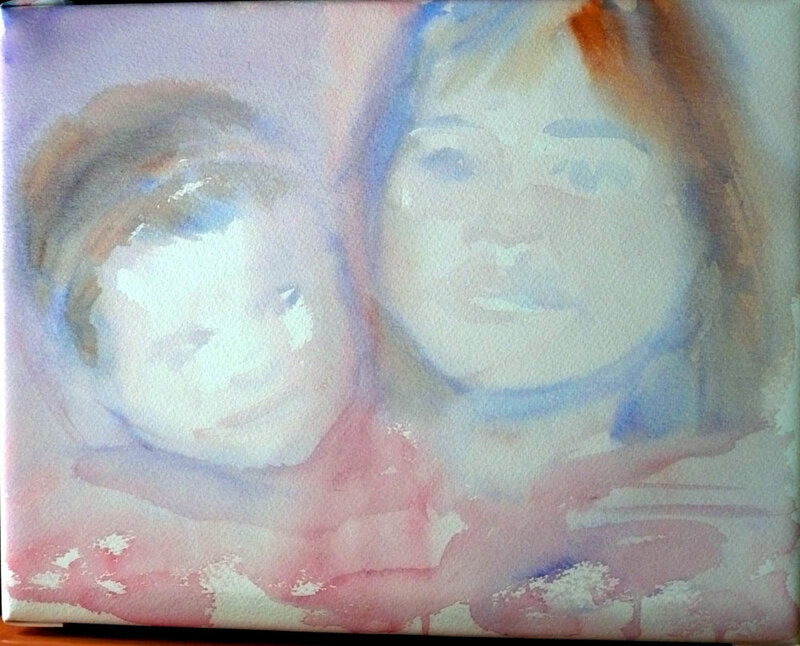 The curious thing about this painting is that the subject is the mom of another baby I painted :). Tried Lanaquarelle cold press 140lb on this. The paper is soft and has nice texture, glazes look beautiful on it. However, the paint sets in a bit too fast and lifting is very hard. I also encountered several light spots that would not take paint (almost like a resist). To learn how to order your own custom portrait, go here. Watercolor on Kilimanjaro CP 140lb watercolor paper, 11x14." Since I'm behind on portraits-a-day, I'm going to count this as two portraits :). Looks like I'm on the roll with in-progress photos :). Hopefully, this will be helpful to somebody. This painting was a commission as well, this time for someone I met at a local craft fair. I'm fairly pleased with the outcome, considering the quality of photos I had to work with (none in focus, poor light and/or flash). And the finished painting. Kilimanjaro, which is a brand of paper sold by Cheap Joe's, is a 100% cotton rag paper that is half the price of Arches. I decided to give it a try and got a 10-sheet pack for $24.99. Well, I am pretty pleased with it so far! I haven't tried any heavy scrubbing or a lot of layered washes, but it stretched nicely and performed well under my usual painting techniques. Incidentally, the Richeson Lyptus Lobo easel that I have I also bought from Cheap Joe's. They had the best price and did not charge me oversize shipping (the easel comes unassembled). To learn how you can order your own custom portrait, go here. 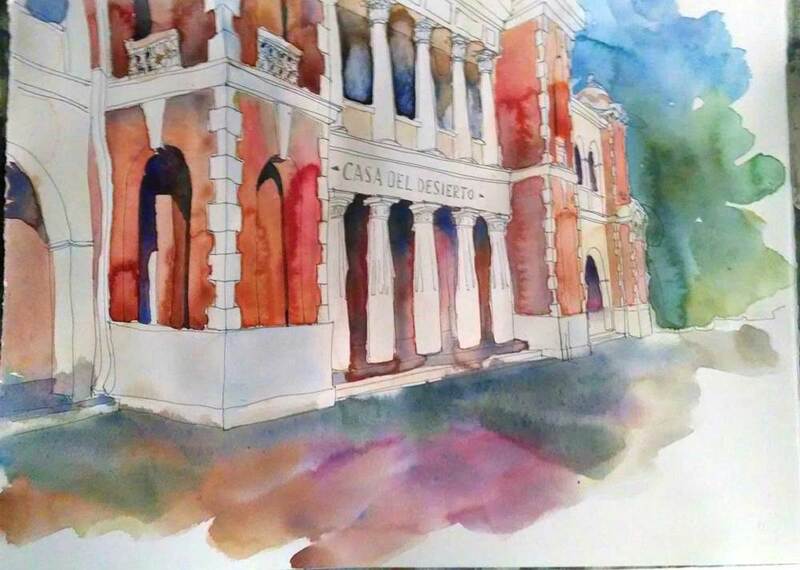 Watercolor on Arches CP 140lv, 9x12." Allen was actually a portrait study somebody commissioned me to do through ArtFire.com. It means that I might just hang out on ArtFire a little longer and hope for more sales to come. I do love the user-friendliness and all the available options of their shops. So, at some point I decided I wasn't going to be happy with this painting and it was too late to fix the structure. I had to start over. Step 1, semi-wet-into-wet. Just trying to get the main shapes in place. I actually went ahead and drew the center line and the eye line of the head with a brush, to make sure I had the angles right. I softened the lines before they were dry. Step 2 - placing smaller shapes and building up the volumes. Step 4 - more detail and more color. The point at which I am still not happy but done. 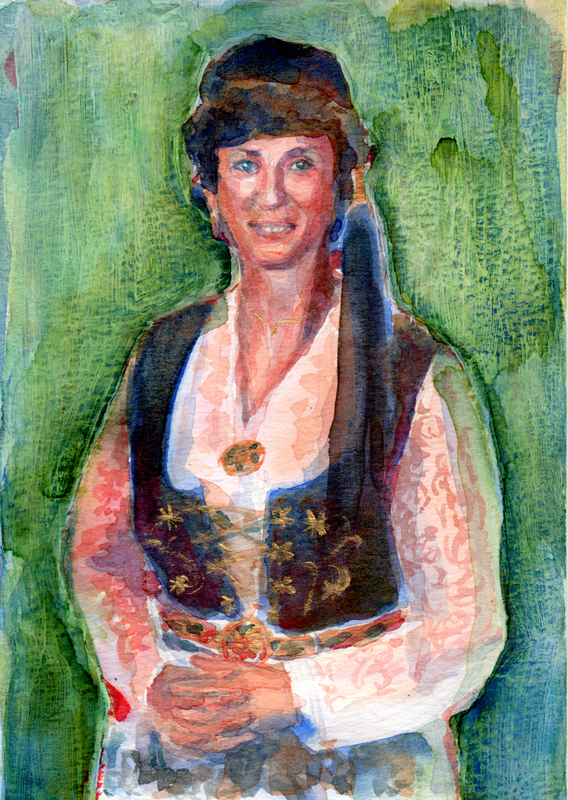 The painting doesn't look exactly like the photograph, but that's not really my objective in these quick portraits. The lady who commissioned the painting was thrilled and said that I captured the boy's spirit :) It is what I was hoping for, then! This is pretty much a continuation of the previous post. I worked on two paintings at the same time, and it was a very interesting learning experience. 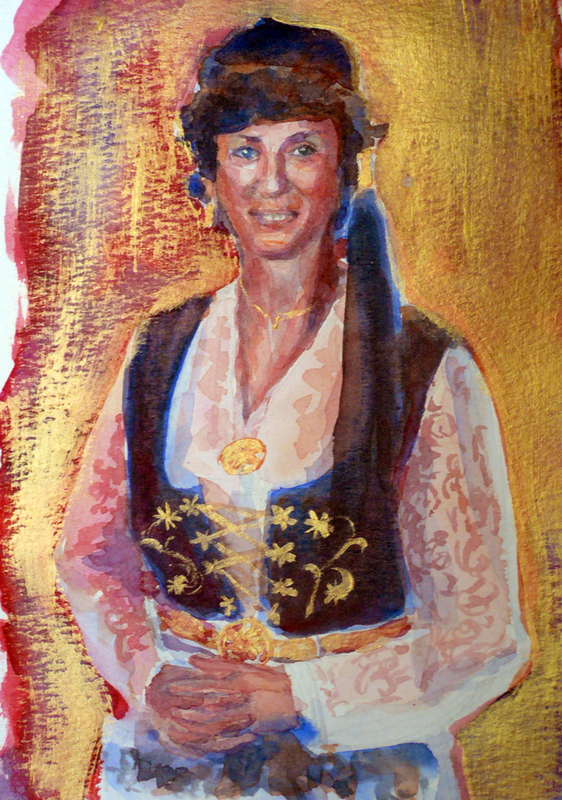 Here are the progress pictures of the 9x12 almost three-quarter figure portrait of a lady in Icelandic national costume. As usual, I started with sketches. This one was only one sketch that I altered many times trying to decide on the background (the reference photo, taken in a studio, has a very boring tan-beige-taupe-bleh background). On a totally irrational impulse, I made the background red. Maybe as a response to the boredom of the background in the photo? The gold in different light. A lot of detail for a 9x12" painting. In addition to learning a couple more things about working small in watercolor (hands were hard!) and spending hours figuring stuff out with an anatomy book (granted, I love doing that), I expanded my knowledge about Iceland beyond Bjork and volcanoes :) a little. 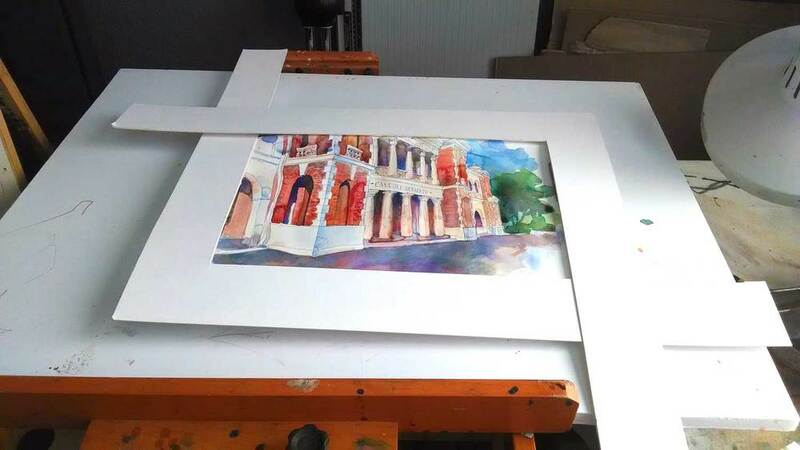 Question: how do you change a large area in a watercolor painting (like the background in those sketches) without painful scrubbing out and washing off? It is also obvious that I did not take the pictures at equal increments during the process. Both of the subjects are back-lit (contre-jour! ), and in the case of the girl with grape-vine, there is also flash from the camera, all of which makes working on it a little confusing. I find myself inventing the shadows and lights on her face, and it feels like her whole face should be much darker.